Apple iOS 7 Firmware has now become the primary mobile operating system for most of iPhone, iPad and iPod Touch devices and users and busy to explore every new features and options available in latest mobile OS and that is why people are using their iDevices 24/7 and throughout day and also facing the problem of iOS 7 Battery Drain Issues on iPhone, iPad and iPod Touch so if you're one of those user who are experiencing the same problem and if you want to know How to Enhance, Increase, Improve and Save iOS 7 Battery Life on iPhone, iPad & iPod Touch with Fixes, than following post will surely help you out. Apple iOS 7 has bought several new features, all new fresh look and performance enhancement and improvement for iPhone 5S, iPhone 5C, iPhone 5, iPhone 4S, iPhone 4, iPod Touch 5G and iPad 4, iPad 3, iPad 2, iPad Mini devices so the battery drain issue and problem will also arise with time but we can solve that problems with just little tweaking and tuning in iOS 7 software. 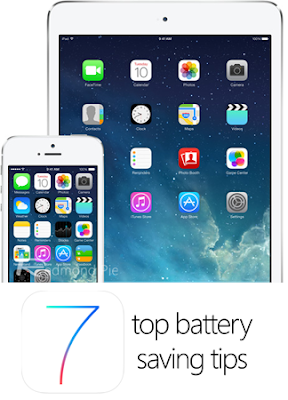 So we have gathered Top 30 Tips and Guide to Save and Increase iOS 7 Battery Life for iPhone, iPad & iPod Touch. For more iOS 7 Tips, Tricks & Guides you can visit and read our previously published post HERE.